The historic port town of Lahaina and the area of Kaanapali are excellent locations to stay on West Maui. 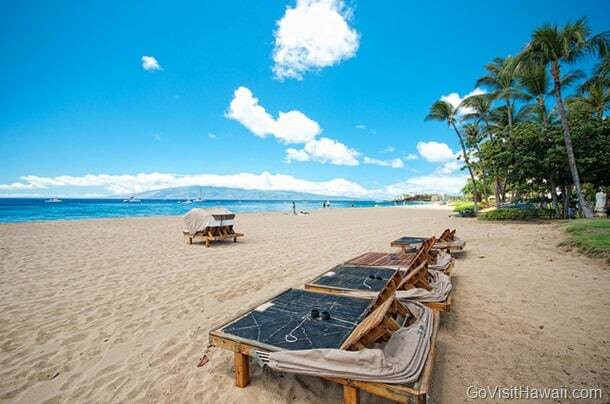 Just north of Lahaina is Kaanapali Beach which was awarded the 2003 Dr. Beach award for being America’s Best Beach. The resort area of Kaanapali provides conveniences within walking distance such as great restaurants, shop and free entertainment in Whalers Village, excellent off-the-beach snorkeling at Black Rock, two championship golf courses and the Whale Center of the Pacific. Kaanapali’s location is well situated for exploring the whole island. Kaanapali makes a great base for a Maui vacation. Lahaina is a lively and charming town with unique shops, art galleries and lots of waterfront restaurants. It is my first time to visit Hawaii and it will be a mom and daughters (both in college) graduation trip. We love beautiful beaches, lush scenery with waterfalls. I have had some friends mention Maui near LaHaina and friends mention Oahu. I want this to be the best breath taking trip. Please help?? It will be my first trip to Hawaii. My husband and I will be traveling with our daughter & son (who are 21 & 23) We are planning on going to Maui for sure. I wanted to know if we would be able to see and do these activities in the Kaanapali area? Horseback ride, see turtles, waterfalls, paddle board & snorkel? You won’t be able to see and do all of those things IN Kaanapali, but you will be able to get to them fairly easily by rental car. Waterfalls, horseback ride in Kaanapali = doesn’t exist IN Kaanapali, but can be found elsewhere on the island. We don’t surf, so we can’t recommend surfing spots. It really depends on the direction of the swells.